Inova cantilevered sliding automatic gates offer far more than perfect security. They project the right image for your company. The innovative design of the Inova cantilever sliding gate in Ireland makes all parts that are used in conventional cantilevered sliding automatic gates such as chain drives, toothed rack and drive covers unnecessary. This drastically reduces production, installation and maintenance, giving maximum security at an outstanding price performance ratio. The essentials of the system are invisible to the eye. Inova cantilevered sliding gates protect your investment, assets and security, permanently and reliably. 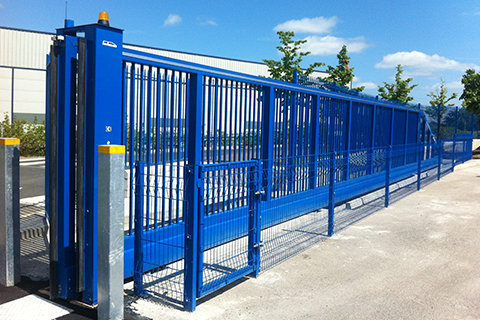 The award winning motor design provides outstanding reliability over other sliding gate models. 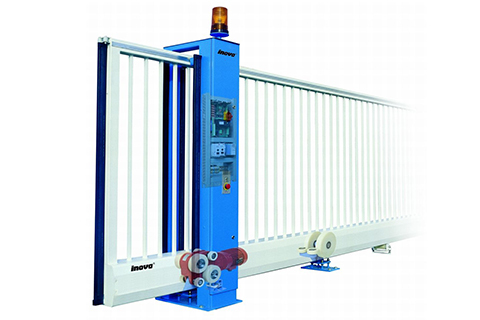 The Inova cantilever sliding automatic gate drive unit is housed invisibly inside the lower gate beam, instead of being mounted on the inside edge of the automatic gate leaf itself, as is the case with most conventional cantilevered sliding gates that run on unreliable tracks or on a rack and pinion set up. This patented drive principal gives the Inova cantilevered electric automatic gates a light, almost floating movement appearance. The patented Inova 4 wheel drive system is invisible from the outside. Having all the drive functions inside the camber of the lower beam gives outstanding reliability in comparison with conventional cantilevered sliding gates – which have part of the drive system in the lower beam and the rest of the drive mechanism on the outside. Completely housed in the lower beam from the weather elements and vandalism, the patented 4 wheel drive system reliably performs its task. With these key running components integrated into the camber of the lower beam, it extensively reduces the components needed and also eliminates ALL outside running gear (such as stud chains, toothed racks, drive unit covers) and gives outstanding reliability, and runs perfectly smoothly even in snow and harsh working conditions. Inova sliding electric gates and cantilever sliding automatic gates Ireland have won numerous testimonials from high profile blue chip clients because of its high security and reliability.